It’s 1970. Four Englishmen with long hair and cocaine teeth come together under the name Black Sabbath and release their self-titled debut album. Their lyrics are fantastic and their sound embodies an impending doom while somehow being funky. It’s grave, it’s heavy and it’s good to get stoned to. It’s 2016. Black Sabbath have announced their final tour, entitled “The End Tour.” They sell out Madison Square Garden for two nights. Posters are $50 and the guy next to me just bought two of them. Fathers are frequent in flannel jackets, mothers have hired babysitters and both plan on drinking at least four beers. I’m both sympathetic and empathetic for the guy who’s wearing a bandana and a black leather trench coat that just barely sweeps the floor. I assume he has discovered Instagram, and his IG handle is “metal-dad68”—or something alluding to lost dreams of Marshall stacks. I see fellow rockers in their 20s and then more dads who are with their dads. I see a kid who can’t be older than 13 wearing a Paranoid T-shirt. It makes me cherish my vinyl copy of the album even more, and I wonder if he knows what “vinyl” is. I’m with my own dad and I can’t help but feeling like I’m stuck in this bizarre vortex of the past and present, and that my future is hiring a babysitter for a night to wear a leather trench coat. But then I look at the kid in the Paranoid T-shirt and all the younger generations in attendance and think, man, rock can’t be dead. 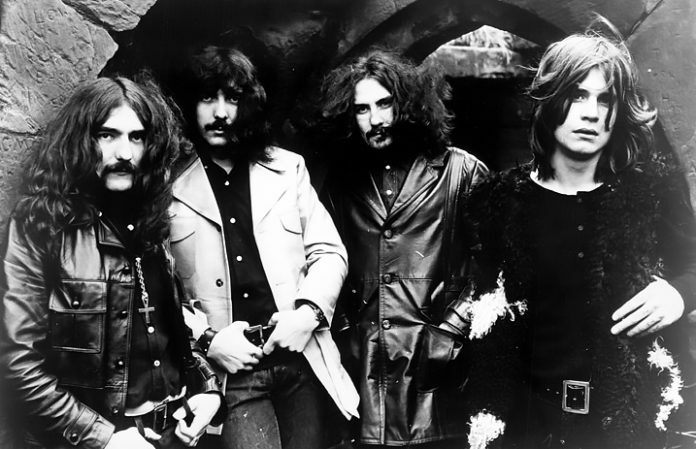 Black Sabbath have released 19 studio albums and are considered the pioneers of heavy metal. Ozzy Osbourne, Tony Iommi, Geezer Butler and Bill Ward revolutionized the world of music. They struck the scene with their psychedelic vision of graveyard riffs, and end-of-the world lyrics. All the outcasts who thought the Beatles were too soft found their new favorite band. It was refreshing and raw. Sabbath took on politics in “War Pigs,” blew magic dust in our face during “The Wizard,” and made us feel other worldly on the recent “Zeitgeist.” Without Sabbath, there’s no Metallica, no Slipknot. It would’ve been impossible for a band like Ghost to win a Grammy for metal without Osbourne, his eyeliner and the astounding musicians behind him. There’s so much other history to be mentioned about Black Sabbath: lineup changes, style changes, the amount of money spent on cocaine during Vol. 4, drummer Bill Ward’s absence during this tour. But all I could think about as they stepped on stage and completely overtook the crowd was what a truly bittersweet ending it was—46 years of rock ’n’ roll. The era of that swirly purple Sabbath logo has reached finality. But not entirely. These are the guys my dad grew up on. I was growing up on them. They’ll be the same guys I’ll (try) to have my kids grow up on. “The End Tour” was more like a beginning; it was the final chapter of an enchanting novel, every page poetry, and through much (black leather) darkness, a light had shone—leaving way for a strong sequel. The young rocker in the Paranoid tee can go home and pick up an instrument and change the world the same way Black Sabbath changed his. It was a night he’ll never forget. It was a night I’ll never forget. It was metal history—and history is often repeated.